The letter featured long ramblings from a stranger, directed to everyone in the apartment complex. An affluent Brisbane unit complex has been embroiled in an alleged animal abuse scandal after a letter, threatening violence against a tenant and their dog, was distributed to more than 150 residents last week. 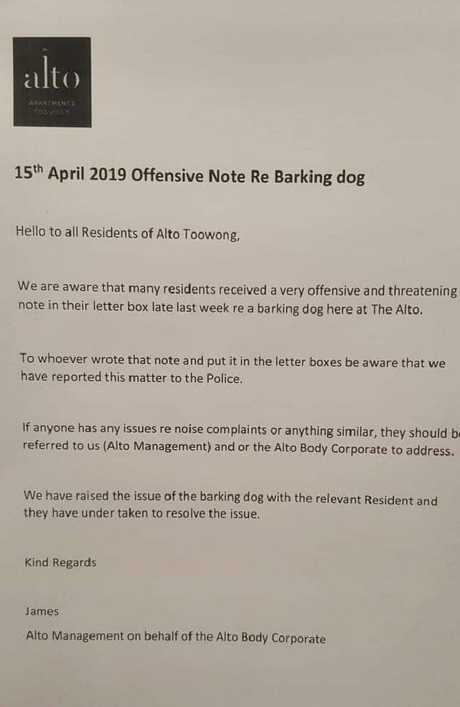 The "very offensive and threatening" note has sparked a serious response from the management of the Alto Apartments in Toowong. A follow up letter, sent to Alto residents on Monday, revealed management is investigating the issue. "To whoever wrote that note and put it in the letter boxes, be aware that we have reported this matter to the Police," the letter said. 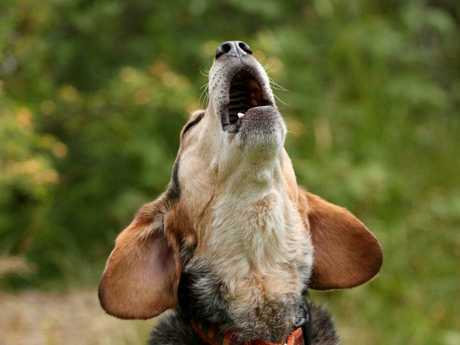 "We have raised the issue of the barking dog with the relevant resident and they have undertaken to resolve the issue." The latest twist in the unit complex drama has involved Queensland Police. The letter continued, urging anyone who has issues with noise to avoid taking such offensive measures in future. "If anyone has nay issues regarding noise complaints or anything similar, they should be referred to us and or the Alto Body Corporate to address," the letter said. It comes after an anonymous neighbour sent a disturbing letter to hundreds of people in The Alto on Friday, in which they made violent threats against the dog and it's owner. 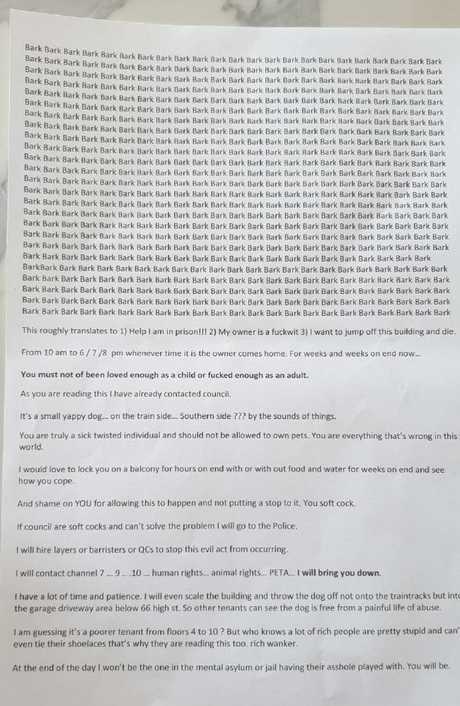 The letter, slipped into the mailbox of all 154 units at The Alto, called out the dog's owner for causing it a "painful life of abuse". The furious neighbour was moved to action by the dog's incessant barking, deciding to take matters into their own hands. But the graphic act has left tenants distressed and on edge. The dog is allegedly left alone each day and barks non-stop. 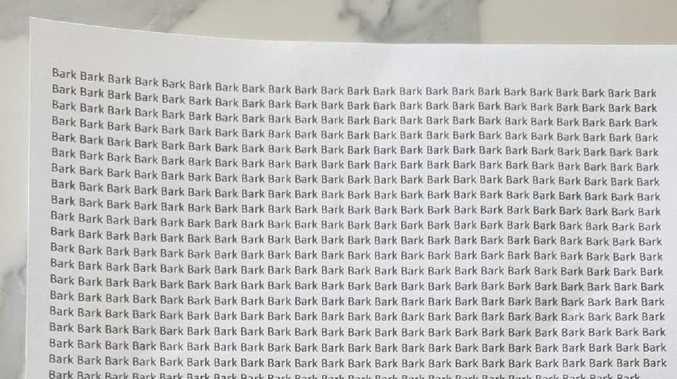 The bizarre letter begins with 25-lines, filled with just one word - 'Bark' - before the author translates the passage. "This roughly translates to 1) Help I am in prison! 2) My owner is a f***wit 3) I want to jump off this building and die," the graphic letter said. According to the author, the poor pup has been barking non-stop for weeks, but it only starts after it's owner leaves for work each day. "You must not (have) been loved enough as a child or f***ed enough as an adult," they wrote. "You are everything that's wrong in this world." 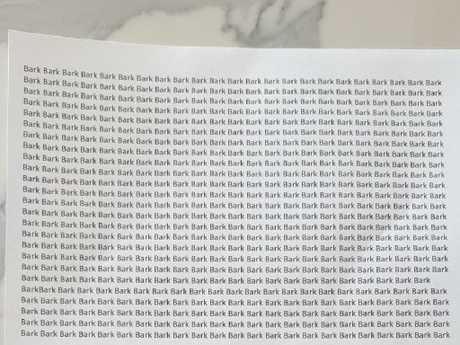 The letter begins with a bizarre 25-line repetition of the word ‘Bark’. 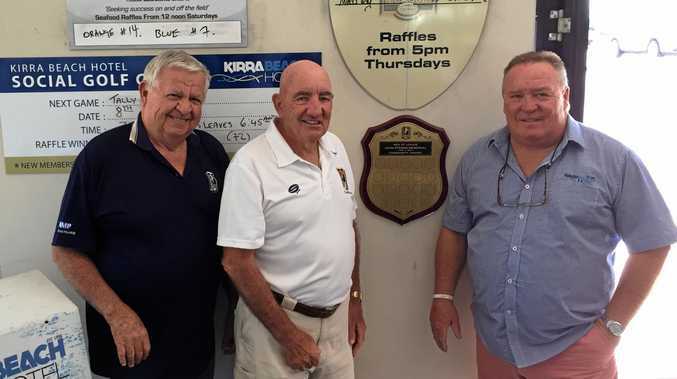 The letter continues, revealing that the author has already contacted the Brisbane City Council about the matter, and won't hesitate to call the police if action isn't taken. "I would love to lock you on a balcony for hours on end, with or without food and water for weeks on end and see how you cope," it said. 'rich wanker' and a 'f***wit'. "I will hire lawyers or barristers or QC's to stop this evil act from occurring," they said. "I will contact channel 7 … 9 … 10 … human rights … animal rights … PETA … I will bring you down." At this point in the note, the author's obvious rage at their neighbour spills over, and the letter descends into some pretty graphic threats. They said they wanted to scale the 20-storey building "and throw the dog off" so that other tenants could see that the animal had been saved. But a source told news.com.au that the recipients of the letter hadn't heard a dog barking and thought "it was insane". Tenants have been told that Alto Apartment's management is investigating the claims in an attempt to figure out who composed the offensive note. News.com.au has contacted Alto Apartments for comment.